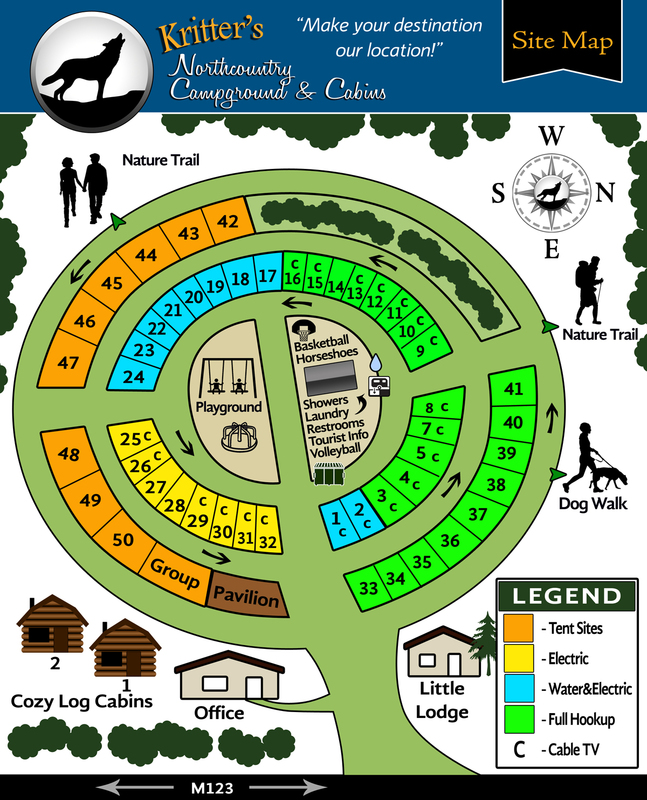 Below you will find the Kritter's Northcountry Campground and Cabins Property Site Map. Our campground provides many great things to do for all ages. Rates for vacationers are below map. SITES ARE NOT DRAWN ACCORDING TO SCALE. MOST SITES ARE APPROX. 25'-35' WIDE BY 60'-70' LONG. TENT SITES ARE APPROX. 80'x 80'. Camping Rates Effective Mother’s Day weekend thru the early part of October. Please call to make your reservation when using a discount. Discounts do not apply to online reservations. Thank you. Camping season begins Mother's Day weekend through October 15th. Lodging will remain open through the end of the snowmobile season. Each additional person age 5 and up is an extra $3.00 per night. There is an advance deposit of at least 1 night required for all campsites that are reserved 3 days or less. A two night deposit is required for campsites reserved 4 days or more. If we have not received your deposit within 5 business days, we will give you a courtesy call. If your deposit is not received within 5 business days of the courtesy call your reservation will be cancelled and a $10.00 cancellation fee will be charged to your credit card. In order to receive a refund, minus a $10.00 processing fee for each site you reserved, there is a 3 day cancellation notice required. Example; if you are scheduled to arrive on Friday and need to cancel you would need to call by 10:00 a.m. on Tuesday to cancel. There is always a $10.00 processing fee for each site you reserved regardless of when you cancel. If you wish to shorten your length of stay, that change must be made 3 days prior to your arrival. There will not be a fee for this type of change. FOR YOUR PROTECTION, PLEASE DO NOT SEND EMAIL TO CANCEL. During a holiday time period, all reserved campsites are a two night minimum stay. For each site you reserve, an advance payment equal to two nights is required. Special events weekends (i.e., car shows, logging museum events, etc) are not a 2 night minimum stay but advance payment is required. If you need to cancel a holiday or special events stay, in order to receive a refund, minus a $10.00 processing fee, you are required to give a 5 day cancellation notice. Example; In order to receive a refund, (less a $10.00 processing fee per site reserved) and you are scheduled to arrive on Friday you will need to cancel by 10:00 a.m. on the Sunday PRIOR to that Friday. There will always be a $10.00 processing fee (per site reserved), regardless of when you cancel. If you have reserved 3 nights or longer and wish to shorten your stay to just two nights, that change must be made 5 days prior to your arrival. There will not be a fee for this change. There are NO refunds made during a holiday time period or special events weekend after you check in. Camping is an outdoors experience. Therefore we do not give refunds for the discomforts of Nature, meaning we do not give refunds for rain, snow, temperature changes or insects. The U.P. is noted for its population of mosquitoes & black flies, so COME PREPARED WITH DEEP WOODS OFF! Days can be warm; nights can be cold. Bring appropriate clothing. Effective Mother’s Day weekend thru the end of snowmobile season. Two night minimum stay at all times. No pets allowed in lodging. The longer you stay the more you save. Please call or email for extended stay rates. RESERVATIONS AND DEPOSIT ARE REQUIRED. Three night minimum stay at all times. No pets allowed in lodging. If you cancel at anytime prior to the required 10 day cancellation notice there is a $10.00 processing fee per cabin/lodge reserved. There is a 10-day cancellation notice required. For example; if you were scheduled to arrive on a Friday, you would need to cancel by 10:00 a.m. on Tuesday of the PRIOR week. For your protection DO NOT SEND E-MAIL TO CANCEL. 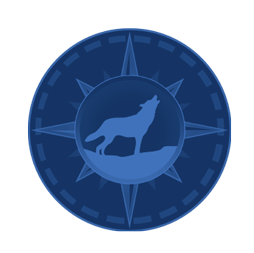 Cabins are a two night minimum stay and the Little Lodge is a three night minimum stay at all times. If you cancel after the 10-day time frame you will forfeit your advance payment. If you wish to shorten your length of stay, this must also be done 10 days prior to your arrival, not after you have arrived. "NO SHOWS" will be charged for no less than 2 days & no more than 5 depending on your reserved length of stay. We do not give refunds for the discomforts of Nature. That includes rain, snow, temperature fluctuations and insects. The U.P. is noted for its supply of mosquitoes & black flies, so come prepared with OFF! Days can be warm, nights can be cold.bring appropriate clothing. Kritter's Northcountry Campground & Cabins is conveniently located near Eastern U.P. attractions. Include a stay with us in you vacation plans!